Some say it can’t be done, pairing wine with chocolate, but if you choose the right wine to complement the right chocolate it can be a remarkable pairing opportunity. Whether you are pairing the sometimes subtle, creamy nuances of delicate white chocolate or the lively bold tones of dark chocolate with a favorite wine, there are a few pairing tips to keep in mind. Tip 1: To keep things simple, start with a wine that is slightly sweeter than the chocolate or chocolate-themed dessert. With both wine and chocolate carrying their own innate intensity, they can often find themselves engaged in a formidable palate power play, each vying for dominance and immediate attention. To help the two settle into some semblance of amiable balance, initially, let the wine bow to the chocolate in the form of a slightly sweeter wine partnered up with the chunk of chocolate. Tried and true "sweet" wine options that cover a wide range of chocolate partners include: the fortified favorites of Port, Madeira, Pedro Ximénez Sherry, and Grenache-driven Banyuls, in addition to several late harvest wine options, and some sweet sparkling wines like Italy's delicious Brachetto d'Acqui or Moscato d'Asti with lighter selections. Tip 2: Opt for a similar style and weight. When pairing wines with chocolate, try to match lighter, more elegant flavored chocolates with lighter-bodied wines; likewise, the stronger the chocolate, the more full-bodied the wine should be. For example, bittersweet chocolate tends to pair well with an intense, in-your-face California Zinfandel or even a tannin-driven Cabernet Sauvignon. The darker the chocolate the more dry, tannin texture it will display. However, when you pair this darker chocolate up with a wine that also boasts stouter tannin structure, the chocolate will often overshadow or cancel out the wine's tannins on the palate and allow more of the vinous fruit to show through. Tip 3: Taste from light to dark chocolate or light-bodied to full-bodied wine. Similar to formal wine tasting, if you will be experimenting with several varieties of chocolates, work from light white chocolate through milk chocolate and end on the drier notes of dark chocolate. By starting with the more understated nuances of white chocolate and ending with dark or bittersweet chocolate, you will keep your palate from starting on overdrive and missing out on the subtle sweet sensations found in more delicate chocolate choices (and wine). White chocolate tends to be more mellow and buttery in flavor, making it an ideal candidate for the sweeter styles of Sherry (consider Spain's rich, full-bodied Pedro Ximénez Sherry), and the sweet, subtle bubbles of Italy's Moscato d'Asti (check out Saracco's Moscato d'Asti), or opt for the heady aromas of an Orange Muscat. The Sherry and Moscato d’Asti will pick up the chocolate's creamy textures and the Orange Muscat highlight any fruit fixtures that may be buried within the chocolate. Another route, for pairing wine with white chocolate is opting for contrast. While a little riskier, when the tasting contrast works well the match is unforgettable. For example, taking the higher alcohol and full-bodied, intense forward fruit of a ​Zinfandel and partnering it with the mild textures and buttery profile of white chocolate can have an unusual "melding" effect. The wine's tannin content softens under the chocolate's fat profile and pops the ripe Zin fruit right to the surface. The ripe, red fruit and often lighter body and silky tannins of a Pinot Noir or a medium-bodied Merlot will work well with the smooth character and cocoa butter components of milk chocolate, a creamy chocolate mousse or chocolate accented cheesecake. Riesling, Muscat or the range of notable dessert wines tend to also hold up quite well to the mild mouthfeel and integrated profile of milk chocolate. Also, consider a sparkling wine or Champagne for pairing with milk chocolate dipped strawberries. The bright acidity and fusion of bubbles bring out the intense fruit flavors and chocolate accents particularly well. When in doubt, go with a classic. The rich textures, fresh fruit factors, hints of chocolate and sweet profile of Ruby Port makes it a no-brainer for pairing with many kinds of milk and dark chocolate choices. Dark or bittersweet chocolates, with higher cacao content (by definition dark chocolate contains a minimum of 35% cocoa solids) call for a wine that offers a fuller body, robust aromas and intense flavor sketches with bold fruit and perhaps its own smidge of indigenous chocolatey nuances. Zinfandels with their dense fruit, energetic spice, and often higher alcohol levels enjoy a long legacy of handling dark chocolate delights exceptionally well. Case in point, California's notable wine growing region of Lodi, places a high priority on Zinfandel and chocolate pairings in their annual Wine and Chocolate weekends. The bold structure of Cabernet Sauvignon and full-bodied profile often wearing juicy black fruit and noticeably defined tannin makes a natural pairing for the decidedly drier style of darker chocolate-themes. Also, consider a Pinot Noir or a Merlot to handle dark chocolate around the 55% cocoa mark. Banyuls, a fortified favorite from Southern France, may present the ultimate in wine and dark chocolate pairings. The full-bodied flavors often hosting their own chocolate nuances, thanks to the Grenache grapes, mirror the palate textures of dark chocolate and produce a sensational pairing synergy that's hard to beat. Along the fortified themes, give a Tawny or Vintage Port a try to offer a well-weighted, complementary character to a dark chocolate dessert or truffle. If you are looking for an easy and inexpensive, Do-it-Yourself way to experiment with wine and chocolate pairings, simply picking up a few bars of Green and Black's premium chocolate is a good way to start. 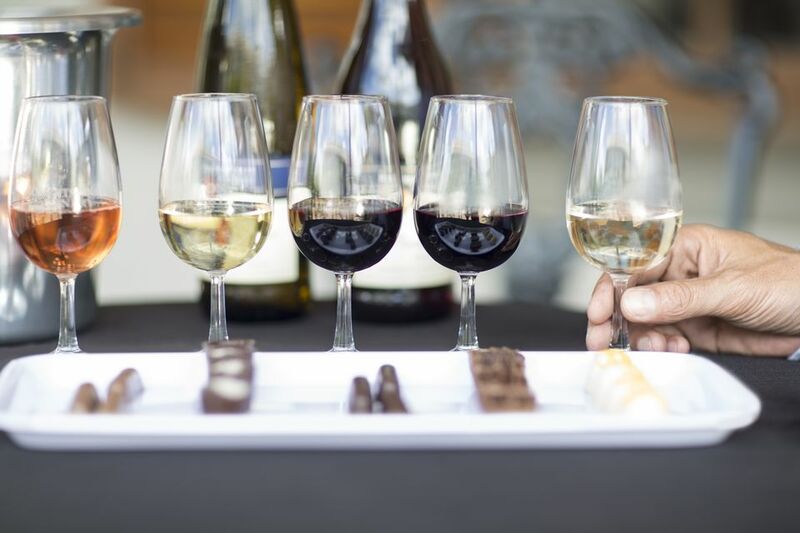 By taking a "mix and match" approach to finding your own personal palate preferences you'll gain "hands-on" knowledge of which wines really complement which chocolate combinations. By opening eight bars of Green & Black's chocolate along with a few bottles of wine we were able to take each chocolate through a series of wine pairings to see which combinations rose to the top. This is just a starting point, the combinations could be almost limitless when you start to shake up not only varietals but vintages and producers with the more than a dozen chocolate bars made by Green and Black's. Personal palate profiles vary from person to person and a wine and chocolate partnership that works well for one palate may not find favor with the next. While both wine and chocolate often share a significant fan base, the two are not necessarily palate allies from the start. However, with a bit of flexibility and delicious experimentation, you are sure to find remarkable wine and chocolate pairings that find the balance and seamless synergy of a well-paired union.